What versions of Java are compatible with Millennium? Blank screen and\or Java console error(s) raised when launching Express (Yellow-Button) Reports based on Crystal formats with no defined\saved parameters. Millennium login fails with this error message: "Sorry, you have exceeded the number of login attempts. Your username and IP address have been locked. You will have to contact the system administrator to unlock your account..."
When you go to insert a new membership for a constituent the message, “Pragma: no-cache Expires” appears on the screen. 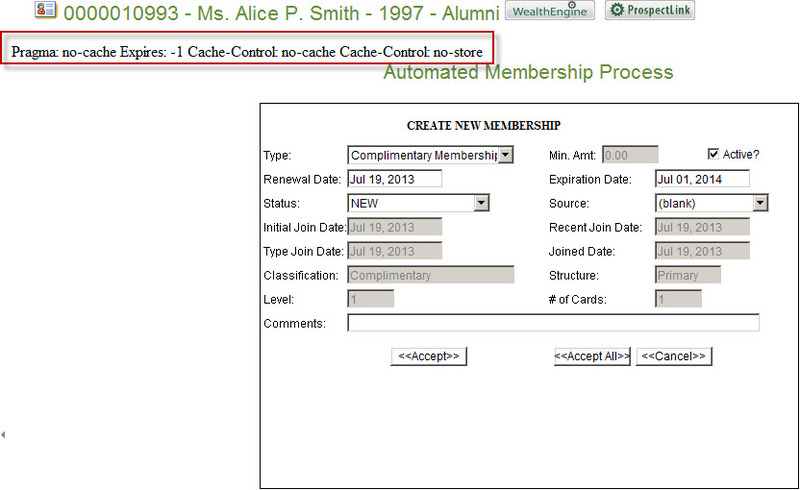 The Automated Membership Process screen then displays. Profile Data View Error: Invaid object name on view. Statement(s) could not be prepared. Some users which are not in specific groups cannot access profile basic data information such as corebio_full, address_full, phone_full, etc. The error “Millnet Couldn’t open data source; invalid object name ‘view_full. Statement(s) could not be prepared. When linking a Prospect/Prospect Manager Relationship to Existing Tracking and Proposals creates two separate Prospect/Prospect Manager Relationship Rows. Special (non-ascii) characters do not display or are substituted within Millennium or when adding data via Advanced Data Examiner. If any of the custom columns added in previous versions of Millennium (e.g. 7.7) are added to gifts/dues>payment screen layout, Sage Ppayment Solutions pledge (sustainer and pledge) processing fails without error. Solicitation search applet ignores case when searching and displaying results. If you have solicitation codes that are similar, like xp and XP, when you enter one of the codes a prompted field in reporting you will not be able to select one of the values. 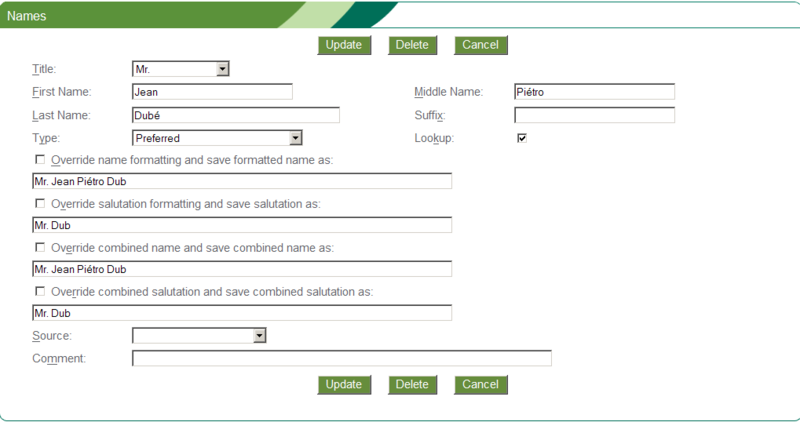 Data Examiner hangs with error manually/automatically accepting pending records with a mapped, blank coressnum field. Characters not displayed when the last character contains an accent. Modifying a constituent's employment row deletes comments on the constituent's relationship row. Expected behavior: Comments on the Employee\Employer Relationship record remain unchanged when said constituent's Employment record has been modified. When using the write a letters feature the top of list gets cut-off if you have more than 30 letters in the \Inetpub\wwwroot\Mill\Letters folder. How do I create the Web SQL ODBC connection object for SQL Server?